Lets look at one deficiency that can be present for years, and why the argument that it has been there for years, holds no water. Bathroom exhaust fans are installed to remove the high levels of moisture from the bathroom to the exterior of the home. Water can be deleterious to the homes condition, so it is no wonder we install exhaust fans in the bathroom. The problem : The bathroom exhaust fan is terminating in the attic. 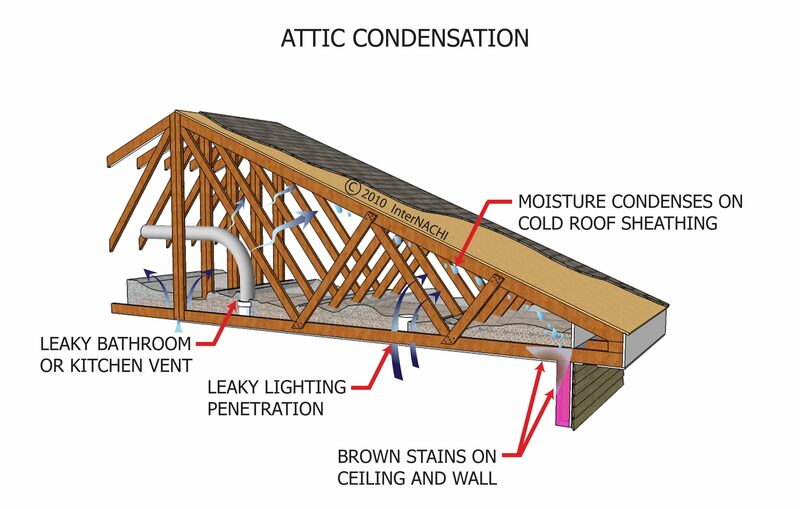 The fan pulls warm moist air from the bathroom, and distributes the air to the attic. On a cold day, the moisture in the air will condense on anything below the dew point. This can be the nails, the sheathing, the rafters, etc. Obviously, condensation dripping from the nails and sheathing is not a good thing. The Defense: Mr. Inspector, are you sure you know what you are talking about? The sellers says it has been this way for years ,and they have not had any problems. The Reality: The problem with this method of thinking, is that it does not take into account the variables that can exist. The current owners may take luke-warm showers; they may take quick showers; they may not even run the exhaust fan. The bathroom in question may not even get used as the owners only use the master bathroom. The prospective buyers may like long, hot showers. They may have a few kids who also enjoy long, hot showers. Their first winter in the home may be particularly cold which would create conditions that had not existed for the prior owners. There are too many variables. The bathroom exhaust vent should always terminate to the exterior of the home, or problems can occur. The Point: The main point here is that defending a deficiency because it has been present for years is lunacy. It is only a matter of time before it causes someone a problem.